I am a UK independent Stamping up! demonstrator. Hello and happy new year to you all. I hope you had a great Christmas and Santa brought you lots of lovely things. It is that time of year when everyone is feeling the post Christmas blues and heading back to work or school. 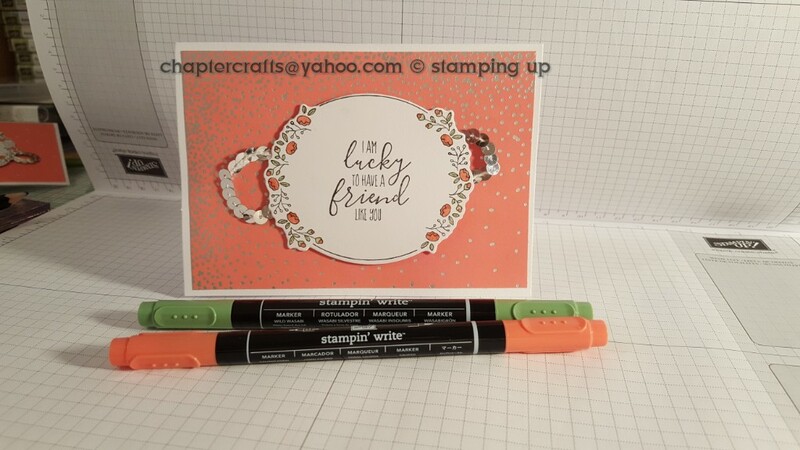 No need to worry this is a very big time for Stampin up! This is the start of the spring summer catalogue which also includes sale.a.bration. For some of you who don't know what this is it is where Stampin up! Not only bring out the new catalogue but for every £45 or £90 spent you get to choose a free item from the sale.a.bration catalogue. 😁😁 Also if you want to join my team during sale.a.bration not only do you get £130 worth of products that you choose for £99 you also get 2 free stamp sets of your choosing as well. So to try and help you guys I am going to be doing a series of videos which have only the items in your craft area or baby spending as little as £50 you can still produce very simple and easy cards. This will also be using 1 of the sale.a.bration items. So here is the first card. This is using the charming café bundle and true sweet soiree designer series paper. 8 1\4" x 5 7\8" score this @ 4 1\8"
Cut the desired sweet soiree dsp down to 3 7\8" x 5 5\8"
Cut out from Whisper White cards stock the flowers from the dies included in this bundle and colour them in using Calypso Coral and Pear pizzazz markers.